A 1990 self-portrait in Morgan Territory Preserve with snowcapped Mount Diablo beyond. Much of the land in the middle distance was then in private hands. Today, virtually all of it has been protected. The district named a ridge and trail here after Walker, in honor of his work to save this rugged landscape. Photo courtesy Bob Walker Collection, Oakland Museum of California. Photographer Bob Walker produced emotionally powerful images that, like no others, dramatized what was—and still is—at stake in the battle between development and preservation in the Bay Area. The images here, drawn from Christopher Beaver’s new book After the Storm: Bob Walker and the East Bay Regional Park District (Wilderness Press, 2007), offer just a hint of Walker’s rich legacy of both images to be admired and wild landscapes to be enjoyed. Beaver’s book is in turn a window onto the nearly 40,000 photos that make up the Bob Walker Collection at the Oakland Museum of California. During his too-short life, Walker made remarkably effective political use of that body of work, leaving no doubt that he was as gifted an advocate as he was an artist. Bob Walker lived in a small garden apartment in San Francisco’s Haight-Ashbury and worked as an apartment manager in Berkeley. Throughout the 1970s and ’80s, he spent most of his free time roaming public—and sometimes not-so-public—open space in the East Bay. With a secondhand camera and no formal training, he took to the hills in what he often described as a simple search for a place to walk his dog. As soon as he could arrange it, Kent hired Bob for the first of many contracts running from 1982 until close to Bob’s death of complications from AIDS in 1992. The assignment was as basic as it was sweeping: Create the first collection of professional photos of the district’s parklands. Bob was in heaven. The contract barely covered film, developing costs, and gas, but he was now a professional photographer. Bob Doyle, in charge of land acquisition for the district, spent long hours teaching Bob to read maps and interpret the region’s topography. As Bob came to understand the connections between his photographs and those maps, he began to wonder what could be done to connect people’s responses to his beautiful photography with their desire to protect that beauty. The answer was not long in coming. This 1989 image, titled “Matchstick Houses,” shows the beginning ofa development near Danville. Walker sought out and photographed areaswhere ridgetops were in imminent danger. Here, developers agreed toturn over the hills behind the houses to the district, and they are nowpart of Sycamore Valley Open Space Preserve, which covers almost 700acres in two parcels. Photo courtesy Bob Walker Collection, Oakland Museum of California. In 1986, Bob discovered a “For Sale” sign on the Marshall property, adjacent to Morgan Territory Regional Preserve, one of his favorite haunts. In that instant, a park activist was born. He began to lobby district staff to lobby the board of directors to buy the property. And he lobbied conservation organizations to lobby the board. Much of his lobbying came in slide show presentations. He shaped his shows as carefully as he took his pictures, and he was able to cut to the heart of an issue and yet remain fair and civil. 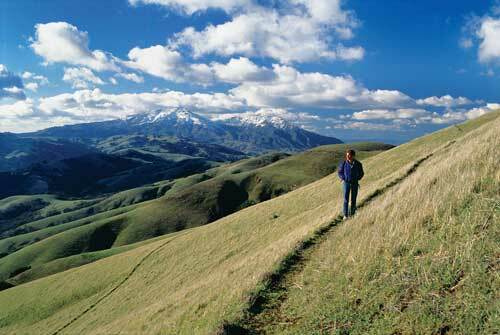 The 1,700-foot Maguire Peak in Sunol Regional Wilderness. Photo courtesy Bob Walker Collection, Oakland Museum of California. Jocelyn Combs served on the board of directors of the East Bay Regional Park District from 1987 to 1998.